Remember how I was raving about innebandy? I still love the sport, and I’m finally getting a bit better at it. What’s so difficult about running around a gym with a plastic club and a wiffle ball, right? The last time I played – about a week ago – I broke my nose. Or rather, my friend Josh did. I ran up behind him to get the ball, and he swung around and his elbow met my nose. It wasn’t his fault – he didn’t know I was there. But “crunch,” “pop,” and *boom* I was down on the floor. It was a pretty solid hit. As I lay on the ground, I felt like the insides of my nose were running out. It was just blood, actually, but it was flowing freely. Gushing, quite simply. I ran into the bathroom and stuffed toilet paper into my nostrils. I got cleaned up and my friend Nils drove me to Karolinska Sjukhuset (Karolinska Hospital) which was pretty close. I ran into the main entrance, asked the reception if there was some place I should go, and was sent to the ER entrance around the corner. As I walked into the ER, I noticed how empty it was. It was Saturday around 4.15pm. I walked into the check-in desk, and woman behind the desk asked me a series of questions in Swedish. I managed to answer most of them but had some trouble when she asked me if I had fainted. We don’t use that word much at work. The woman noticed I didn’t quite understand so she switched to English briefly just to I could answer the question. She finished the paperwork, sent me to her colleague working the cash register, and I paid my 350 SEK. The doctor was cute. A plus! She sat me down in the examination chair and slowly pulled out my toilet paper. I glanced at the paper as they threw it into the trash; they were drenched with blood. She used a pair of plier-looking-like things and examined the insides of my nose. She gave the instrument to the med student and asked me if it was okay for him to examine me. I nodded in agreement, and he took a look too. I didn’t know this at the time, but I think they were examining my septum to ensure that it wasn’t damaged. The doctor told me they were going to put some stuff up my nose, and asked me if I was allergic to something. I had no idea what she asked, but I knew I wasn’t allergic towards any medicine, so I told her it was fine. I probably should I have asked for a clarification. It turned out she was asking if I was allergic against numbing solution. They had dipped these cotton swabs in numbing solution and they stuffed it up my nose. I had no idea that a nose could take in so much, but they just kept stuffing and stuffing. I was sent back out to the waiting room for 10 minutes. After getting called back in by the cute doc, they took the cotton out, inspected my nose again, and then gave me a shot of some other numbing stuff. Then she took another instrument, put it inside my nostril, and PULLED outward. Crack! Crack! I guess that was her realigning the bone. 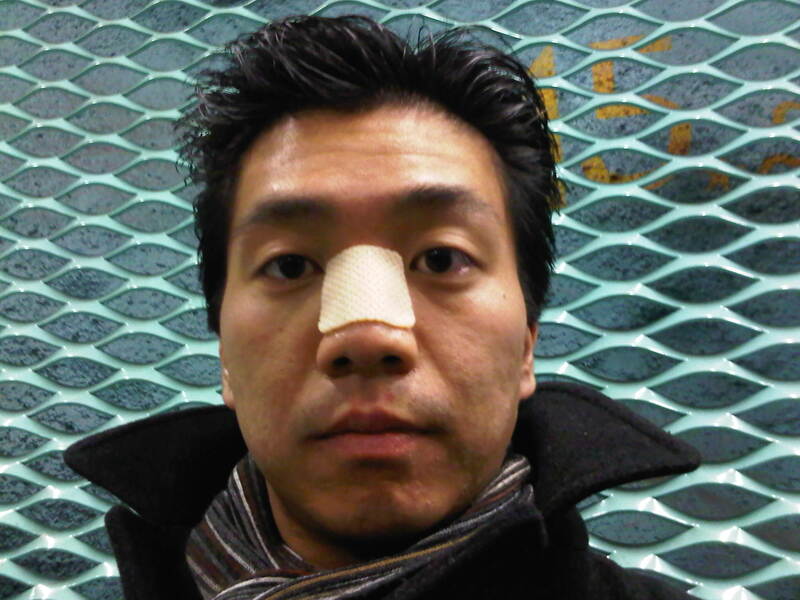 They put a little nose cast on me and sent me home. Keep it on for 5 days, and if your nose still doesn’t look straight, give us a call and make another appointment, they said. This entry was posted in Colleagues, healthcare, innebandy, TrulySwedish on November 27, 2011 by Kenneth Chen.